Low vision aids are devices to enhance vision for those that have impaired vision that cannot be corrected using conventional spectacles. We recognise the challenges patients diagnosed with low vision face. We have optometrists with a special interest in low vision. 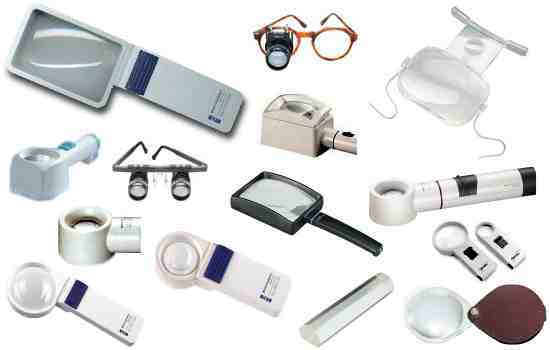 We carry out a full assessment of your vision at the present time, a thorough investigation of the problems you are experiencing, a discussion of your requirements, and then attempt to meet these, using high powered or tinted spectacles, telescopes, magnifiers, lighting and other simple gadgets. We see patients of all ages, including carrying out assessments on children in school, and people in work. The Clinic does not offer medical or surgical treatment for any eye diseases. If, after assessment, it is felt that such treatment might be appropriate, or further medical investigation of your eye condition is needed, then you will be referred to an eye specialist - an ophthalmologist - via your GP. At the end of the Low-Vision Assessment, we may recommend that you try a magnifier, a lamp, or a special pair of spectacles to allow you to see more clearly. Low vision aids are used in a different way to "ordinary" spectacles, and it takes a little time and effort to get used to using them. You will be trained in the use of the aid, and then take it home to practice. You will then be followed up after 2-3 weeks to make sure that the aid is successful. We may suggest that you practice reading and using your eyes in a different way, in order to make the best use of your remaining vision. Contact us or come into the practice to find out more and to arrange a low vision assessment.